Oh what a joyful blessing it was to receive a letter in our mailbox from Ghana today! Our Ato Sam, who will be 11 in July, has written us a beautiful 6.5 page letter in addition to the Ghana response letter form Compassion has provided him. Ato Sam's letter gives a wonderful glimpse into the Compassion child's world. I would like to share it with you in it's entirety. Ato Sam (aka Sam Sam) is the one holding the bags of rice, surrounded by his family. Ato Sam says he was very happy to receive your letter which you let him know what you and his family in Canada are doing. He says he does not know what to say because you always make him feel special among his peers in the project center and at school as well. He says by the grace of Jesus, he and his family are very well. He says he thanks you so much for the books that you sent and he says he was grateful for that. He says it sounds like you are his special mother, that you always care for his schooling and how he should behave. He says he was happy to hear from you how God has blessed you and his family in Canada with good health, peace and happiness. He says it is his wishes that God will do greater things in the next days to come. He says that he thanks you for the address that you gave him as "our wise, precious and beloved son". (I had addressed his letter in February as such, I always address it to remind him of how I see him -- beautiful, wise, precious, beloved, strong, wonderful, amazing, etc) He says he appreciated that very much. He says his siblings in Canada are back to school and he prays that God should guide and protect them and give them divine understanding in their studies. He says that he thanks you for explaining to him the difference between the soccer and the football. He says he realized that the soccer is different from the football. He says in Ghana, the football is the same as the soccer ball that he saw in the picture. He also adds that he has not seen the football before like the one in the picture. He says how is the relationship between Terry and Jesus, and is it good now? He says he and his family pray for your marriage, that any promise that God has made concerning your marriage should come to pass. He says you also requested that he should pray for (J____) and (M______) (friends of Jillian's) and he says he had learned that God will let his light shine in the life of (J_____) and (M______) and released them from any difficulty in life. Ato says I should answer the question myself because I know more than him. (I had asked him to ask his project director if he was the 3rd born in his family because his name includes the name Mensah, and in Fante culture, that usually signifies the third born male.) The name Mensah has now become a general name to the children who were born a third male in the family. We have real on written without the letter "h" as Mensa, and the pronunciation is different from Mensah but I am second born in my family and Mensah is my surname. All the same, you guessed right. Sam Sam says in his Compassion project, there are four types of season letters that they write to their sponsors. He says that these are (1) Christmas Greeting Cards (2) Christmas Thank You (3) Holiday Letters (4) Response Letters. He says that according to the Project Workers, the children must try and write letters to their sponsor to keep the relationship close. Ato says yes, he does tell the Project Coordinator what he wants to say and the coordinator also translates it into English. He says he speaks Fante while the coordinator translates. He says he has kept all the letters at a safe place and hopes that one day, he can read all and understand by himself. He says that the letters are received at the Project Office and they will be informed to come with their parents and reply to the letter. He says that some of the parents are illiterate and the Project Workers guide them to read the letter and reply the letters too. He says anytime that the letters will be in, he and his family come around [to the Compassion Center] to listen to the letter while in the evening too, his father reads to the family again and prayed when there are any prayer requests. He says the other children receive some letters once in a month/while, others do not receive letters at all. He says that every week, the caregivers come to the Project Office to write the children letter and sometimes some of these children are too young to write or speak (express their letters orally). He says the parents assist the children to write in replying the letters and also hold the children's hands to draw (if they need help). He says concerning his English studies, he has been learning a lot from you through the books that you have been sending. he says "Nyame nhyira wo (? )", which means may God bless you. He says his father is planning to send him to another school so that he can improve upon his studies. He says this can happen after this year's maize harvest while some will be sold for his school fees. Ato says yes, there are some months that food finds it hard to grow, especially of November, December and January to April. He says some of the farmers including his parents do not grow crops but rather feed on previous food. He says his parents have some extra but not in all the months. He says his parents try to keep money which was [obtained] out of the selling the produce and also gather firewood for selling so that they may use it for other food items. (His parents are subsistence farmers and Ato Sam once explained that they sometimes sell the extras to obtain fish and other foods.) He says fish are not common food in his community. He says he would reply your questions in the other letters since the time is gone. (*chuckles! *) He says he would in the next day to continue the letter writing with his father. He says he loves you much and prayed that God should give you strength and good health to do His work. He says may God also give you all the resources that you will need to do His work and cause more workers to come in (there is only one explanation this precious child knows just how to pray... God told his heart about the Ghana project!). He says, "How are you and the whole family?" He says he will be going to witness a football (soccer) match between his school JSS team and another school at a different town this week and it is his wish for his school to win. He says pray for his school team to win this particular match and come home with the trophy. Memory Verse: Psalm 37:5 "Commit they way unto the Lord; Trust also in Him; and He shall bring it to pass." I have a child available from Ato Sam's Compassion Center in Ghana. Six and a half year old Nicholas is currently unsponsored, and as such, he does not receive any letters or the love of a sponsor. It is Ato Sam's prayer that anyone reading his letters would feel led to also make a difference in the life of his Compassion brothers and sisters through sponsorship. If you would like to sponsor Nicholas, please let me know, and I will give you the appropriate info to contact Compassion with. A sponsor has just been found for Nicholas!! Thank you so much for your prayers! I stumbled a blog of another Compassion "Peep" the other day, you know the kind of blog that makes you ask yourself how you've ever missed it (and should come with a warning not to sip any fizzy liquids while reading?) Yup. Her personality is refreshing and her posts remind me of journals I have of my kids' adventures from previous years. This one's for you, Madame Bohemian Bowman! Hubby nudged me awake this morning before he left. I had the day off, but had to get up to help the kids get ready for school. Jillian had spent last evening working very hard on her first big project, "All About Canada". She was so proud to have finished it last night, she even showed it to Tia via webcam. I hadn't even had a chance to lift my head off the pillow when she came into my room with a bewildered look on her face... When she grabbed her school stuff as she was getting ready, she came across the instructions for her project. And realized she has missed several things. The OCD in me (CDO, in alphabetical order) had to be restrained as I watched her write, cross things out, re-write, and scribble a bunch of random stuff on the pages. I didn't have a chance to worry much about it, thanks to Brandon wandering into the bedroom and announcing that Ginger had puked all over his bedroom floor during the night. I quietly told him where the paper towel was, and explained that this would be his responsibility, since he had left stuff out that Ginger got into the night before... He didn't argue. He knew he couldn't. I was pleased to hear the sound of paper towel sheets being torn off the roll in his room, but those pleasantries didn't last long. Josh provided a perfect distraction for me: "Mommy, have you seen my shoes?" "Yes, Josh, they're in the backseat of daddy's car..."
To which Jillian added "... which daddy just drove to work..."
My first question, other than "Uhm, why were your shoes in the car? ", was "Do you have another pair of shoes...?" Wait a minute, back up... I have more shoes than one of my kids? How'd that happen? Is this candid camera? Uhm, ok. Brainstorm.... what about the gardening Crocs, Josh, you know, the ones you leave strewn about outside and that I can't find when I need them? Yeah... didn't think so either. Does Brandon have any shoes you could use? He needs them for gym today? OK, that won't work. "I'm so sorry that your insecurity is causing you to project pain onto others... but wait! There's an app for that!!" "All set. OK, out you go, the bus will be here any minute! Those shoes look great, Josh, you can't even tell!" Blur of red and tan rushes past me and out the door. OK, that's Brandon, followed by a blur of blue jeans and pale blue glitter. Poor Josh... praying for that boy today! Last but not least, a blur of psychadelic medley prances past.... That's Cindy Lauper, of course, on her way to the bus... wait, wait a minute, Ms. Lauper does not live here. Who is that? "JILLIAN, what in the world are you wearing, dear child??!" Two shirts that do NOT belong in the same zip code, much less layered together. A suede/wool coat (it's sunny and warm). And finally, the piece de resistance... Blue tights that have gaping holes in them in various and obvious places. I wasn't sure what was most surprising -- that she chose to wear underwear, or that she might have worn underwear because she realized that everything else was see-through. It's at that point that Josh and Brandon yell "BUS!!!!!!!!!!!!!!!!!!!!!" I tear downstairs to the laundry room, grab a clean pair of her jeans, instructing her to take the tights and tutu off. I run back upstairs only to discover that she can't get the tutu off, it's stuck. So I haul her jeans on, didn't even get them zipped, tell her she has no choice but to keep the tutu on. She shoved her shoes back on, and ran for the bus. I did manage to give her a hug, because I knew she was feeling pretty overwhelmed at that moment. She held up well, though. Lead 'em by example, indeed. Cindy Lauper... I might have to double check the family tree. I always wondered who Jillian inherited her style from... Off to Google how Cindy Lauper dresses these days -- I feel the need to brace myself for the upcoming teenage years -- after I clean up Brandon's room, that is... Since all he did was cover each pile with a sheet of paper towel. P.S. Huby just called, he needs a drive to the airport in Bangor, Maine. He's on his way to pick me up... Never a dull moment at The Zoo. P.P.S. Hubby just got home. I don't have to drive him to Bangor... but he has to drive himself to Boston. BOSTON? Really, really?? He'll be there at least a week, which means he will miss Josh's ballet recital, and that Josh's birthday party will have to be postponed. I'm SO glad that he and I both have a healthy sense of humor: We've spent our entire morning laughing at the adventures life brings us on. Never a dull moment at the Zoo, thankyouverymuch. This time, the Happy Mail Dance wasn't caused by a letter from our Compassion children. But our Compassion children will be excited when we write to tell them that we're one step further in our preparations to welcome home our youngest daughter. The bedding we ordered to "match" Big Sister's bedding has arrived. Different brand & quilt, but beautiful combination. Springtime takes my breath away. they rise in worship to the One who has risen to give us hope. May our harshest seasons never discourage us from seeing HOPE unfolding. Although Africa has taken a front row center seat in our lives lately, it's certainly not the only adventure our family has embarked upon. As we shared in a handful of recent posts, we're smack-dab in the middle of the adoption process. At the moment, we're finishing up the home study in anticipation of the matching process. We are eager for the day that we'll be welcoming a little girl into our family. I remember first considering adoption at the age of four, and being sure even then that I'd be an adoptive mom someday. That never changed. It hasn't been easy. Adoption rarely is. When we began this process 4 years ago, we realized it wasn't yet time, so we put our plans to adopt on hold, not knowing if the time would ever come. That time did come last summer when we learned of a little girl in our community who was available for adoption. "M" was our daughter's best friend's little sister. We were familiar with her, she'd been to our house a handful of times, and we loved her very, very much. We were hopeful that we would be a great match for her, so we re-opened our file and threw ourselves into the process in hopes of having a chance to be matched. While it can normally take a year or two to get a spot in the mandatory adoption classes since they only hold it once or twice a year and it's normally at max capacity, we were blessed to have grabbed a spot at the last minute. While we waited for the course to begin, we worked hard to complete all the necessary paperwork. We knew it was normally not required until after the course, but time was of the essence, we were fighting against time for this little girl. We began the course in November. Finished the course in December. All our paperwork was finished in early January. By the end of January, our file was declared "officially complete". By the first week of February, we were on a waiting list for adoption case workers. Although we've heard that the average time to be assigned a case worker was 8-9 months followed by another 2-3 months for appointments to begin for the home study, once again, things were in our favor. In spite of a case worker shortage, we were assigned a case worker on March 14th. She contacted us on March 29th and two days later, she was in our living-room beginning our first home study interview. Although we rejoiced in having gone through much of the process so quickly, the joy was bittersweet -- it was already too late for "M". We had learned earlier that week that "M" had been matched to another family before we had a chance to be considered, even though they knew that we were really hoping to adopt her. We always knew there was a possibility that would happen, but it was still very difficult to hear. There were some raw emotions that week as we processed the news. While it hit me hard at first, I quickly began to focus on the positives. All along, we had prayed for a family for "M". Yes, our hearts very much desired for our family to be hers, but in the end, our prayers were answered -- "M" had been blessed with a family. I only had to consider was how "M"'s new parents felt at the news they'd be bringing her home, how blessed they were, and I couldn't help but celebrate alongside of them. We could understand how long and how hard the waiting period can be, and they had been well rewarded. In His time, our turn would come as well. We believe that we would have been a great match for "M", and we love her so much... but as a mother with an intense mother's love for this child, I couldn't help but question the love I had for this child if I was so "easily" able to let her go. Don't get me wrong, my heart hurts, but my heart also rejoices, and the joy far outweighs the hurt. How is that possible? There once were two women who both claimed one baby to be theirs. King Solomon, after praying for wisdom, told the women he had a solution: He would cut the baby in half, and they could each have half the child. One woman accepted. The other woman immediately refused, relinquishing all rights to the child. The act of giving up her child even in the face of difficult circumstances was evidence of the love she had for that child. And so it is with "M". Further evidence of love -- God gave up His only Son for us. His sacrifice in no way meant that He loved Jesus any less or that this didn't grieve Him. He can't love any less, He IS love, and we are to reflect His love in our lives. We have since met with our case worker twice, and we're meeting with her again this week. Within the next week or two, these meetings will be over, and we will await the news that a child has been matched to our family. Even though I realize that this can take years, I can't help but be filled with hope that not only will it not take years, but better yet, it will be a match beyond what we could possibly have asked for or imagined. That's simply how God works, after all! If our family seemed to be such a wonderful match for "M" but another family was matched to her, I can't even begin to imagine what God has in store for us. in every society, in every family." Kofi Annan is a native of Ghana -- I pray that his vision and wisdom on education will become a reality for the child slaves of Lake Volta. Seven months from today, we will be flying over the Atlantic ocean on our way to Ghana, West Africa. How can time be flying by so fast already?! Seven months may seem like a long time, but it's not when you're facing a project of this size. It's barely been two weeks since we launched our Ghana project, and what a two weeks it has been!!! It's been busy and wonderful -- the enthusiasm and support has been tremendous!! We're so blessed to have surpassed 1% of our fundraising goal for the school, and we are already approaching the 2% mark! We're very grateful and encouraged by your support and prayers. Every single dollar raised makes a difference, there is no amount too small, God will use it all! Many of you have shared our project with friends and families on blogs, Facebook, Twitter... thank you!! An easy-to-remember URL has been created just for sharing -- www.tinyurl.com/Ghana2011 - feel free to use it to share about this project. You have also asked about the possibility of doing monthly donations as well as donating toward the school supplies and expenses. We loved your suggestions, and have created a monthly donation option via Paypal. As of today, there are 7 months left until the trip, so this option will give you the choice of donating $5, $10 or $20 monthly for 7 months. If you'd like to subscribe for a different amount, let us know, and we will add it to the options. We have also begun our local fundraising initiatives for our travel expenses. You may have wondered exactly who is going to be traveling to Ghana in November, well, wonder no more! I (JD) will be traveling to Ghana with my son Joshua, who will be 13 in May. We will be traveling from our home on the east coast of Canada. Joining us will be my best friend Tia from Michigan, and our friend Debra from Illinois. Tia, Debra and I met in 2009 while reading "Crazy Love" as part of Angie Smith and Jessica Turner's "Bloom Book Club". The "Bloom Book Club" has since been integrated into the (in)courage website, where we have been reading Ann Voskamp's "One Thousand Gifts". Tia is no stranger to Africa, having been there twice and having written a book about her time in Africa. She and I both sponsor children in Africa, including in Ghana, which is one of the reasons we chose to contribute to a mission project in Ghana. Debra made the decision to join our team when she read the blog post about the children sold into slavery -- she knew she needed to do something, and for her, this meant not only joining in the fundraising effort, but working alongside side of us in Ghana. Our theme for April is "School 2 School". We are challenging teachers and parents of school aged children to hold penny drives, sports fundraisers, skip-a-thons, hat days or various other fundraisers at their schools in order to partner together to build the school in Ghana. What an amazing teaching opportunity for the kids! Homeschools are welcomed too! Compete with the schools in your area to see who can raise the most funds during the month of April, and share your successes with us! We'd love to feature your child's class or school here in an update post. Last but not least, please pray as Joshua, Tia, Debra and I continue to prepare our hearts for this journey. It is a heavy responsibility, one we've been entrusted with and are passionate about, and your prayers and support will be crucial in the months to come. Thank you for sharing in this adventure with us! I'll be honest... the title intrigued me. 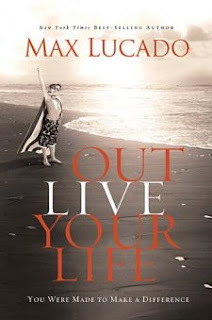 "Outlive Your Life". What's that all about? Then, the description came, and I jumped at the chance to read this book. Remember when you thought you could change the world? You still can! These are difficult days in our world's history. 1.75 billion people are desperately poor, natural disasters are gouging entire nations, and economic uncertainty still reigns across the globe. But you and I have been given an opportunity to make a big difference. What if we did? What if we rocked the world with hope? Infiltrated all corners with God's love and life? We are created by a great God to do great works. He invites us to outlive our lives, not just in heaven, but here on earth. It’s not enough to do well. We want to do good. We want our lives to matter. So, let's live our lives in such a way that the world will be glad we did. Simply put, the description describes my lifesong and this season in my life. I live this every single day, and was eager to read a book not only because I enjoy hearing from others who feel this way, but in order to fuel and inspire me to do more... but in the end, it was as though I was sitting across from a friend who tried to convince me of something I already agreed on, and it left me hungry for more "meat". I didn't find it challenged me to the next level, it was more of a basic review of what I'm already experiencing and living. I finished the book because it was well delivered and I appreciated the stories and Biblical reference. Even though I had personal reasons for feeling this way about the book, Max Lucado is a gifted writer and I enjoyed his writing style. The only Lucado books I had read were children's books, and I would enjoy reading more adult Lucado books in the future. My only other issue was the emphasis on World Vision. While I appreciate the work that World Vision does, I wasn't expecting this book to feel like an infomercial for WV. I sponsor 12+ kids through Compassion based on much research and personal conviction, and so much emphasis on WV made it awkward and uncomfortable for me. In the end, I give this book 3.5 out of 5 stars, and recommend it for anyone who is at the beginning of this journey or in need of renewing the fire within.